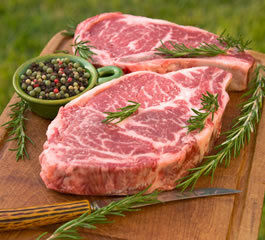 What are you getting when you buy Sweetwater Plantation Wagyu Beef? Whole, ½ and ¼ steers are available at $5.95 per pound hanging weight. Individual cuts and packages of cuts are also available; Contact us for pricing and availability. Inquirers from Georgia restaurants and retailers welcome.